Summer is finally here, and that means families all over the country are starting to fire up the barbecue grill and open up their beach chairs. But summertime also means hot weather — sometimes dangerously hot. This threat is especially true for Texas where extreme heat waves have become more frequent in recent decades. More intense and prolonged excessively hot temperatures in The Lone Star State have raised concerns over how global warming may impact this upward trend. This has ultimately led to the question: Why are we seeing the largest trend in Texas? A team of scientists funded by the NOAA MAPP Program investigated this question and found the main culprit to be a strengthened change in ocean temperatures from west to east (or gradient) in the tropical Pacific during the preceding winter. Deng explained that prior to this research, scientists believed abnormally cold ocean temperatures in the eastern tropical Pacific, or La Niña events, primarily influenced Texas heat waves. However, the authors noted that La Niña alone is insufficient to explain the increase in Texas heat waves, leaving a previously unexplained gap in the drivers behind the trend. Imagine a pool when the heater is turned on—temperatures rise at a fast rate in the area surrounding the hot jets, while the other end of the pool takes longer to warm up. This is happening in the western Pacific, where warming has accelerated over the past few decades compared to the eastern Pacific, creating a strong temperature gradient across the ocean in the winter. This gradient causes more warm air heated by the ocean’s surface to rise over the western Pacific - a process known as convection - and decreases convection over the central-eastern Pacific. Deng explained that both the enhanced and suppressed areas of convection can trigger different waves which propagate through the atmosphere, eventually forming a high pressure circulation pattern over the Texas region in the summer. 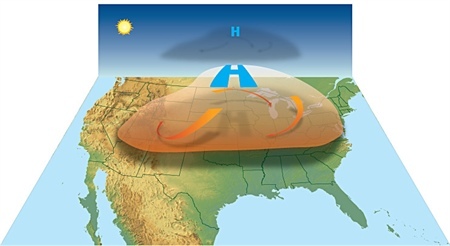 “This [high pressure circulation] reduces precipitation and increases downward solar radiation, leading to a dry and hot soil that favors the occurrence of summer extreme heat waves,” said Deng. Deng added that though cold La Niña waters can also increase the west-east temperature gradient in the winter, warming in the western Pacific contributes significantly to the relationship between the gradient and Texas heat waves. “[Our findings] will hopefully help with better forecasts and planning for possible heat waves occurrences in the future,” said Deng. Though their research didn’t explicitly address the role of climate change, the team mentioned that previous studies found an increase in the Pacific Ocean temperature gradient due to global warming. So, given their results, the authors said this would point to even greater increases in Texas heat wave occurrences. But thanks to Deng’s research, if forecasters take the gradient-heat waves linkage into account, the potential prediction improvements could provide essential information to prevent severe health, ecosystem, and socio-economic impacts from future excessive heat. According to a recently released assessment by the NOAA MAPP Program’s Drought Task Force, heat waves can also exacerbate droughts. However, on the flip side, droughts can propel a rise in temperature, creating a feedback loop of dry soils and heat waves. The Task Force explained that other factors further complicate this relationship, but Deng’s results could help better monitor and predict droughts and associated heat waves in the context of a warming climate. Deng, K., M. Ting, S. Yang, and Y. Tan, 2018: Increased Frequency of Summer Extreme Heat Waves over Texas Area Tied to the Amplification of Pacific Zonal SST Gradient. J. Climate. doi:10.1175/JCLI-D-17-0554.1, in press. NIHHISThe National Integrated Heat Health Information System helps decision makers prepare for extreme heat events days, months, and years in the future.